Workers at two hotels in Oaxaca said they noticed a few seconds of shaking but no real damage or injuries. "Yes, we felt the shaking for 15 to 20 seconds, but no damage," a woman at the front desk of the Hotel Marina in Huatulco told ABC News. Despite the lack of building collapses or serious damage, hundreds of panicked people took to the streets, fearing the effects of possible aftershocks. No deaths or injuries have been reported. 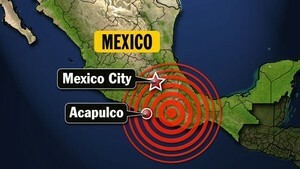 Mexico City Mayor Marcello Ebrard tweeted, "we have an earthquake," according to the Associated Press. Mexican President Felipe Calderon tweeted that no serious damage had been reported and that the epicenter was in the municipality of Ometepec, in the state of Guerrero. Calderon also tweeted that "all of the power generation facilities are unaffected and functioning." He said officials have taken care of the few service disruptions. He added that there were "only scenes of panic and building evacuations, at the moment." "We all dropped to the floor as soon as we felt it," Martinez told ABC News by telephone. "Merchandise was falling and many of our perfumes are broken, but everyone is safe. That's what matters. "We're scared and we don't want to go outside." Martinez said he was "too scared to be on the phone right now" because she still felt tremors. Additional reporting by ABC News' Alicia Tejada.